Caching is a great way to improve website performance and minimize the load. An ideal cache displays the cached version until the content changes and flushes the cache when there is a change. Yet, there may be cases where the cached version is not the most up-to-date one (if there is a DB error on the site or the caching is only time-based..). And, we may want Uptime Robot to load the non-cached version on each request to make sure that the uptime/downtime is decided accordingly. Here is a tiny feature (a pro tip) that can help bypassing cache. in the querystring with a unique timestamp every time so that each request is unique. and the request will have a different querystring each time. Hope this helps for a better uptime. This entry was posted in Announcements and tagged Cache on March 25, 2019 by Umut Muhaddisoglu. All the requests sent from Uptime Robot are using pre-defined IPs to make sure that we all know the source of the requests. And, if exists, please make sure it is whitelisted in your firewalls. Also, the full list of the IPs used can be found here. P.S.> If you had never needed to whitelist or take action regarding to Uptime Robot’s IPs in the past, then you probably don’t need to take any action and can ignore this info. This entry was posted in Announcements and tagged IP on February 27, 2019 by Umut Muhaddisoglu. Uptime Robot treats all HTTP statuses equally. They mean either up or down… except HTTP 401.
which looked like the best way at the early days of Uptime Robot. Yet, there are edge cases on both scenarios like “a monitor with no auth info returning HTTP 401″ may also mean that the site/server is experiencing configuration issues and this must be detected as down. if needed, it will be customizable with the HTTP status customization feature. This change will give room to handling this HTTP status however preferred and the change is planned to go live on 1 March 2019. This entry was posted in Announcements and tagged 401, HTTP on February 24, 2019 by Umut Muhaddisoglu. A Downtime, What Happened and… Very Sorry. Last Thursday (10 Jan 2019), starting with 02:30, we experienced an issue that caused a full downtime of ~12 hours and intermittent issues more than that afterwards. First of all, so so sorry about this. And, as a summary, it was totally our fault. Uptime Robot is available since Jan 2010 and it is the first time we had such a major problem. Our main DB server became unreachable. We first thought it was a network issue, then discovered that it wasn’t able to boot and later on made sure that the harddisk had problems. We were ok as we had the replicate DB server. Decided to make it the master DB server. We couldn’t connect to this server at first, made a power reboot, then connected and made a huge personal mistake here. Before starting the (MySQL) DB server after the reboot, we had to change several of its settings so that it was ready for the live load. Besides few my.ini changes, we removed the innodb logs so that they were re-created with the right settings. Started the server, all good.. and it stopped by itself. Checked the MySQL error logs and saw that there were sync problems with MySQL’s log sequence number being in the future. The problem is, with the power reboot, the DB server was shutdown unexpectedly and we must have started it with the original settings, then stopped normally and make the changes afterwards. A simple yet huge mistake. After lots of retries with different options (including forcing innodb recovery), some major tables didn’t recover. The latest backup was ~23 minutes ago before the incident. We restored it. The latest logs backup was ~7 hours ago before the incident. Yet, the zip file was corrupt. So were several of the latest backup files. The latest healthy logs backup was taken 7 days ago. We tried to reach the contents of the corrupted backup files with several methods/tools but failed (this process took the most of the hours as we wanted to re-enable the DB with the latest log file backup). And, we restored the backup taken 7 days ago (since that day, we tried with much more tools, suggestions, etc.. yet, convinced that those files are corrupt at their cores). We made the site live after the restore process but realized that there were many inconsistencies due the date differences of the backup files used. Worked on creating a tool to remove those inconsistencies, paused the system for another 3 hours the next day, ran this tool to recover all the inconsistencies and made the system live again. After the event, when looking at it calmly, the most logical explanation is the harddisk having an issue for several days before totally going down and corrupting the local backups we had taken on it (which we then moved as corrupted). And, we couldn’t restore the log (up-down) data between 03 Jan to 10 Jan.
Not using a RAID (this was due to a negative experience we had with RAID in the past but, thinking twice, it was still better than having a single corrupted harddisk). Handling the replicate going master badly. We must have had a more detailed self-documentation about this process. Taking larger backups locally and then moving to the backup server. Also, we didn’t have a communication tool in place when the system was fully down and user data was unreachable.. which is so wrong. The backup scenarios are already changed including verification for each backup file. Getting ready to move all critical servers to RAID setups (will share a scheduled maintenance for it soon). Already updated our recovery documentation accordingly and will be documenting such cases in more detail from now on. Working on creating a better communication channel that is not tied to our infrastructure. Very sorry for the trouble again, we learned a lot from it and we can’t thank enough to all Uptime Robot users for supporting and helping us during the issue . This entry was posted on January 22, 2019 by Umut Muhaddisoglu. Uptime Robot is already integrated with the major team communication apps and here is another addition: Google Hangouts Chat. Inside Hangouts Chat, create a new web-hook URL in Room menu>Configure webhooks>Add new. Inside Uptime Robot, create a new alert contact in My Settings>Alert Contacts>Add new>Google Hangouts Chat using the previously created Hangouts Chat web-hook URL. Attach this new alert contact to the monitors of your choice from add/edit monitor dialogs. This entry was posted on January 9, 2019 by Umut Muhaddisoglu. Google had announced that Chrome would begin distrusting certificates issued by Symantec Corporation’s PKI and the decision is followed by other major browsers. These are the certificates by Thawte, VeriSign, Equifax, GeoTrust, and RapidSSL that are issued before 1st of December 2017. And, as the distrust is in effect and visitors are displayed an error on these websites (like ERR_CERT_SYMANTEC_LEGACY), Uptime Robot’s SSL monitoring feature now also considers these errors as a reason for downtime. Such downtimes are displayed as “Distrusted Certificate” in the dashboard and the feature is live in the Pro Plan. This entry was posted in Announcements and tagged SSL on December 11, 2018 by Umut Muhaddisoglu. Uptime Robot sends HEAD requests for HTTP monitors and GET request for keyword monitors by default (and, this is a good default setting for most monitors). 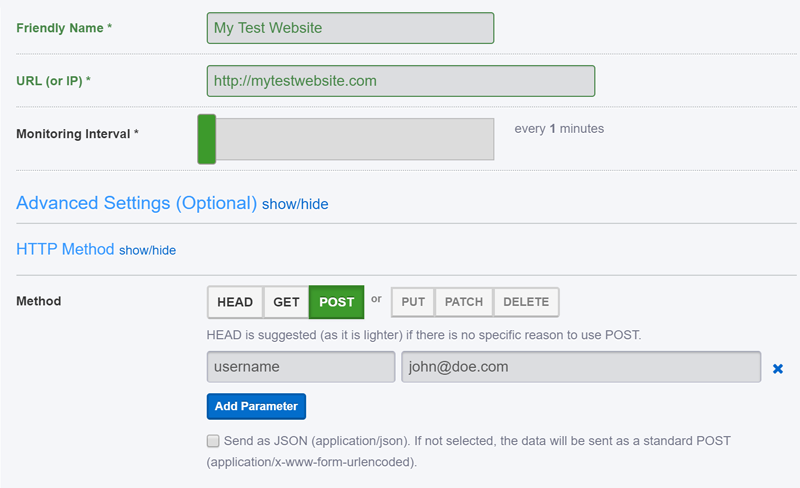 Monitoring your APIs which expect specific methods (a perfect match together with the custom HTTP headers feature). So, here comes the HTTP method selection which enables us to choose the method, send the parameters to be sent (if needed) and also decide if the data will be sent as JSON or not. The feature can be reached from Add/Edit Monitor dialogs>Advanced Settings>HTTP Method and also through the API. P.S.> HTTP method selection is a Pro-Plan only feature. This entry was posted in Announcements and tagged API on November 7, 2018 by Umut Muhaddisoglu. There is never “too much” when it comes to the ways of getting notified about an emergency. And, in some cases, this emergency can be a website or server going down. Today, voice call notification is added to Uptime Robot and it can be very helpful when we want to make sure that a notification is heard :). How to add voice call alert contacts? Once the number is added, an automated call will reach instantly to deliver an activation code. Click the lock icon besides this newly created alert contact and enter the activation code received in the automated call. And, attach this alert contact to the monitors of your choice from the add/edit monitor dialogs. No one prefers to get disturbed and there are ways to make sure the voice calls are received only when there is an important downtime. Uptime Robot has an advanced notifications feature (in the Pro Plan) to get notified only when the downtime is longer than x minutes and using this feature together with the voice calls will be a smart choice. Additionally, it may only be the “voice calls for the down notifications” that we prefer to get. A very recently introduced feature also enables that too. The feature is priced just the same as SMS messages (and a call is considered successful only when the call is answered). P.S.> As a reminder, it is now possible to get 2x SMS or voice calls for the same price (more details). This entry was posted in Announcements and tagged SMS, Voice Call on September 27, 2018 by Umut Muhaddisoglu. Need Only the Down or Up Notifications? You are Covered! Uptime Robot sends notifications for down and up notifications by default for each alert contact type. There is now an option inside the new/edit alert contact dialog where we can choose to disable down or up notifications for a given alert contact. Simple..but it can be powerful :). This entry was posted on September 17, 2018 by Umut Muhaddisoglu. Uptime Robot supports multiple methods to get notified about downtimes on mobile (SMS, push notifications via the mobile app, Pushbullet, Pushover or Boxcar). And, SMS is one of the most reliable notification methods specially when no data plan exists. to make sure that they are notified of longer/important downtimes in case there is no data connectivity. Also, the SMS messages included in each Pro Plan is doubled as well. We’ll also be introducing few new features (very soon) to make sure you can use the SMS messages more effectively. Yay! This entry was posted in Announcements and tagged SMS on September 13, 2018 by Umut Muhaddisoglu.